Respect the technique...join the movement. 6th Annual Original Works Showcase "THE SOUNDS OF BLACKNESS"
Africa In America Presents its 6th Annual Original Works Showcase for African Diasporic Music and Dance entitled, "The Sounds of Blackness". This night of reflection will kick off a beautiful weekend of fellowship amongst the participants and lovers of African Diasporic music and dance here in the Los Angeles area. 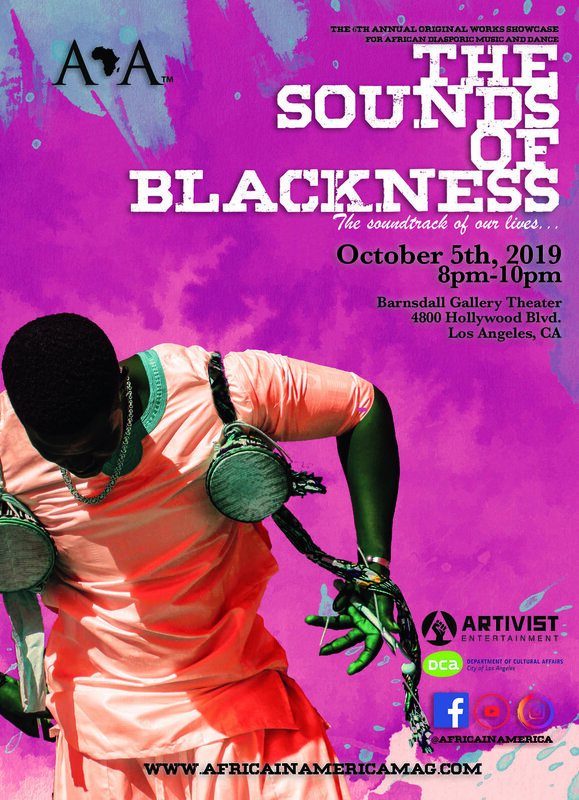 In this year's showcase, we will shine a light on the diaspora's soundtrack of our lives as we feature original works from musicians, vocalists, and drummers on October 5th at Barnsdall Gallery Theater from 8pm-10pm. Artists from both North and South America, West and South Africa, and the Carribbeans will represent on stage in a 1 NIGHT-ONLY event! There wil be an afterparty this year, so people will be able to meet and greet these amazing artists.